Ecopods claim to not only be thinking outside the box; they’re re-inventing the box. 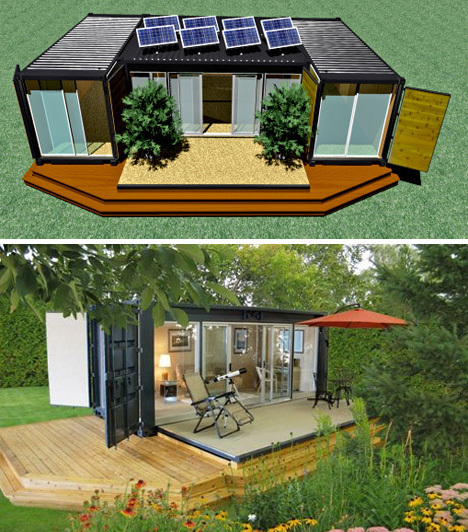 These small, eco-friendly structures are designed to be used as add-ons or temporary use buildings, such as guest bedrooms or home offices. But it’s easy to imagine using it as a primary residence, as long as you don’t mind living in a small space. The cargo container buildings are designed to be off-grid and as ecologically sound as possible, incorporating recycled and recyclable material. The pods can be moved just about anywhere with ease, and the hydraulic-powered deck/door is designed to keep the structure very secure when it’s not in use.